This web page is part of my interest in optics and light. When optics is combined with electronics you get electro optics. Ultraviolet light (Wiki) has a wavelength shorter than visible violet light (Wiki, 400 nm) and longer than X-Rays (Wiki, 100 nm). Atmospheric absorption stops the shorter wavelengths from getting to the earth's surface, but the longer (near violet) wavelengths do get to earth can cause sun burn. 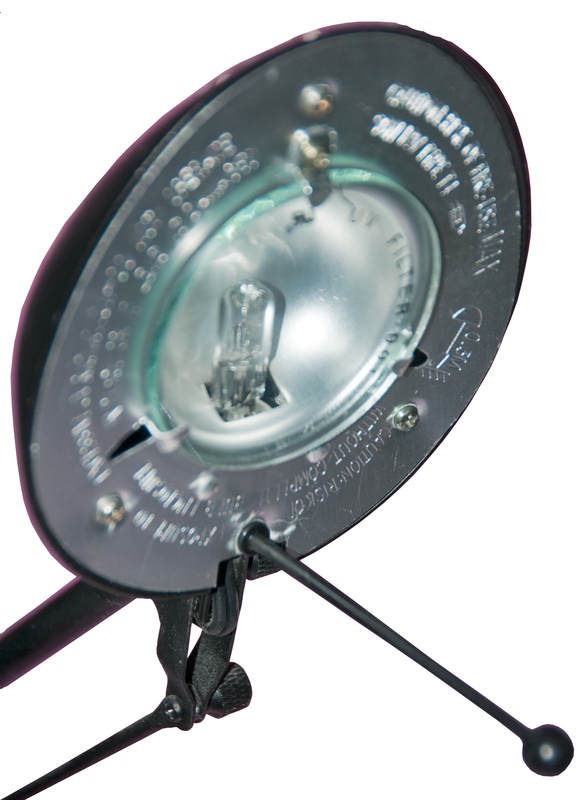 For general information about various sources of light see my lights web page. Sun [Wiki plot altitude vs. altitude (ozone)] - being a black body (Wiki), as are filament lamps, the sun emits UV radiation, but the atmosphere does not pass all of it. 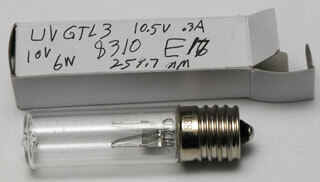 Incandescent light bulb (Wiki) - and especially Halogen lamps (Wiki) because the quartz bulb passes UV, but even a normal filament lamp but with a quartz bulb will make a useable UV source. I think the 6 Watt mark on the box is my typo and should have been 0.6 Watt. i.e. 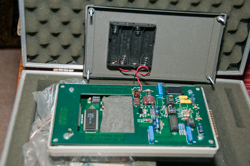 10V @ 0.3 A is 3 Watts input so the UV output will be way down from that, such as 0.6 Watts. This is not Wood's glass (Wiki) since it appears clear. New in carry case with goggles and extension cord + spare 160W 120 VAC lamp. 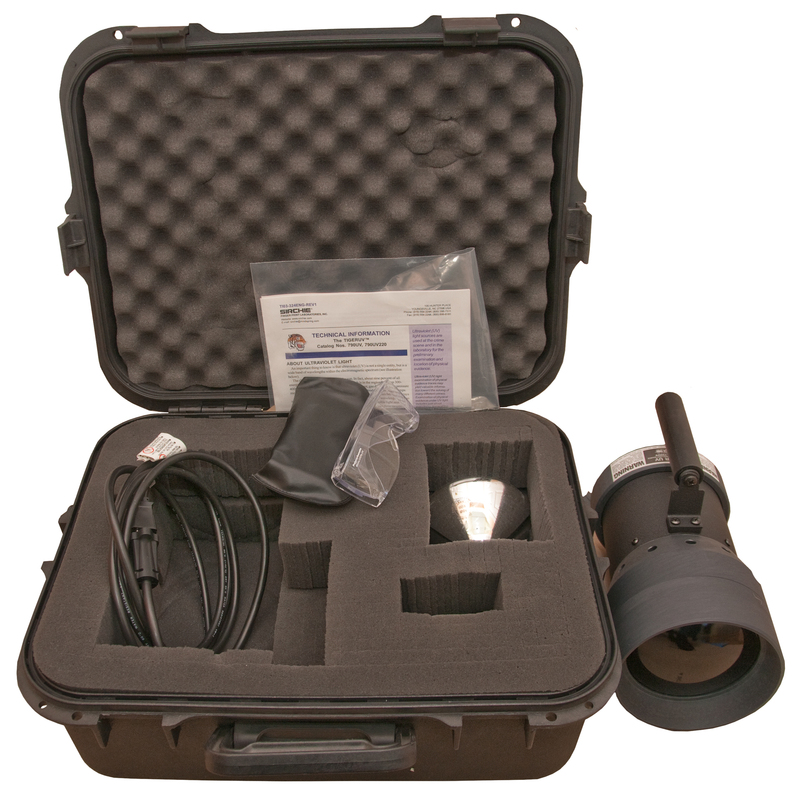 Sirchie web page for the 790UV - Alternate Light Source (ALS) - "A wide beam of 365nm UV light is useful to scan large areas for evidence at the crime scene. Evidence such as fibers, bone fragments, physiological fluids, and others can fluoresce in the presence of UV light, uncovering what was hidden without it." (Wiki) - typically high pressure tubes. mercury-vapor gas-discharge lamp where in normal lamps the inside of the glass tube is coated with phosphers (Wiki) that are excited by the UV light and radiate visible light. But a UV fluorescent lamp has no phosphers and sometimes is made from a glass that transmits UV light better than common glass. 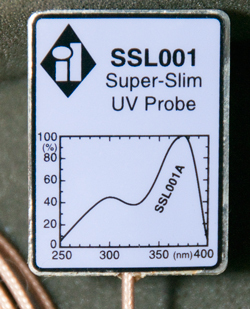 (Wiki) - Near UV (375 - 395 nm) are commonly available for low cost, but the shorter wavelengths (down to 240 nm) cost a lot more and are used for things like Alternate Light Source (Wiki: ALS) applications like viewing crime scenes. Experimental LEDs at 210 nm are in labs. On-w/o Glass: about the same? There are different models, this one is the origional button keypad version (IL1400A manual). Dynamic Range: 1.11e-5 to 9.00e-1 W/cm² (limit exposure to prevent heat damage). Spectral Range: 260 - 400 nm. The SEL623 and SEL624 are thermopile sensors with very broad wavelength ranges. 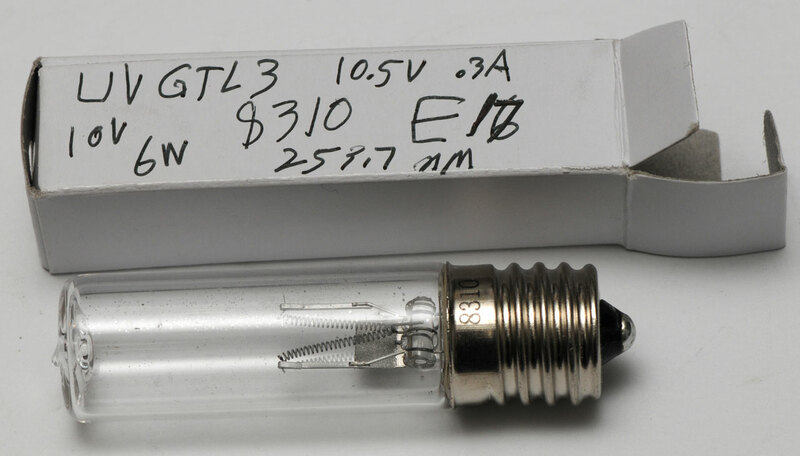 The 155UG tube is offered on eBay. These are used in countries with 220 VAC mains voltage as flame detectors. Made by Ultraviolet Products Inc. San Gabriel, California, U.S.A. Things to look at with a UV light. This application goes back many decades, the oldest UV light I have is from my father's interest in rocks and minerals. Geology.com has a web page about this. In high shool I was in the Air Scouts and we met at Moffett Field. They had Link Trainers (Wiki) that were fixed to the floor and about 30 feet long. There was a cockpit and a teachers console. The instrument lights were UV and the markings and needles were phosphorescent. That way a pilot preserved his night vision while still being able to easily read the instruments. There are some photos taken using UV light on my Aircraft Clocks web page. One way to make a whiter white is to add phosphors so that the UV from the sun will not only reflect white light but also cause the phosphor to glow white. Some of the paper IDs in my wallet have whiteners as part of their design. Maybe to make counterfeit versions easier to spot. The paper money of most countries has a number of features designed to make counterfeiting more difficult and to allow automated bill acceptors to correctly recognize the value of a bill even when the physical size of the bills are the same. Charge cards often have a UV appearance that differs from their white light appearance. My California DL has two photographs, the large white light viewable photo and a smaller UV only version.